Notebook computers are ubiquitous these days. It’s not uncommon to see someone typing away & navigating the web on a laptop in their living room, while comfortably lounging on the couch. Many of my friends do this on a daily basis, making their living room their personal base of operations. If you’re a Google TV owner, you have probably wondered if it is possible to easily share & send links, websites & web pages to your Google TV from your Windows laptop. After all, if you’ve got a huge HDTV staring back at you from a living room wall, why watch that new YouTube video on the small screen? Well now you don’t have to! 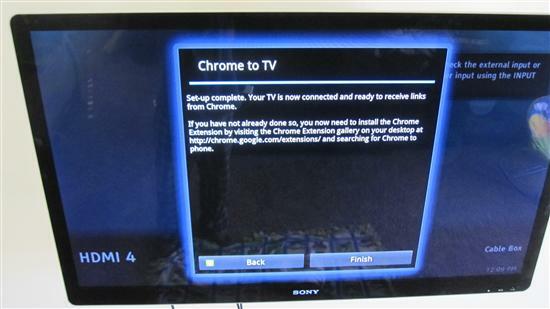 Google TV has a very under-publicized feature aptly dubbed Chrome to TV, which allows you to send website URL’s to your Google TV from the Chrome browser, with just one click. If you’re familiar with the Chrome to Phone browser extension, then you’re halfway there, as Chrome to TV uses that same mechanism. From your Google TV device, press the home button, click All Apps, navigate down to the “Settings” app & click it, navigate down to “Input device” and click it. 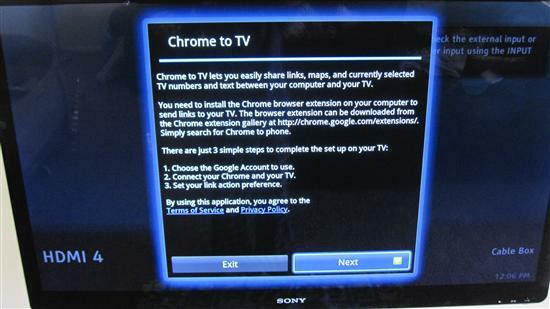 Navigate down to the “Chrome to TV” as shown below and click it. After clicking the Chrome to TV input device, you’ll be greeted with the Chrome to TV welcome screen, which describes the feature as shown below. Click Next to continue. 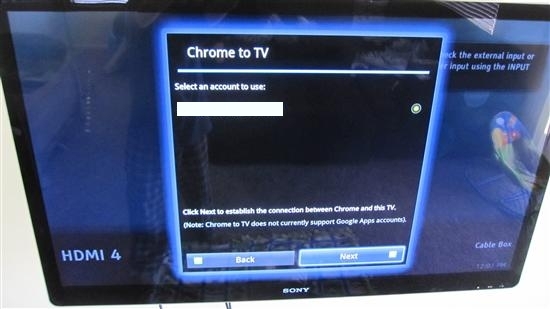 This next screen asks you to confirm or select the Google account that you’d like to use with Chrome to TV. I’ve blotted out my account name in the image below for privacy/security. 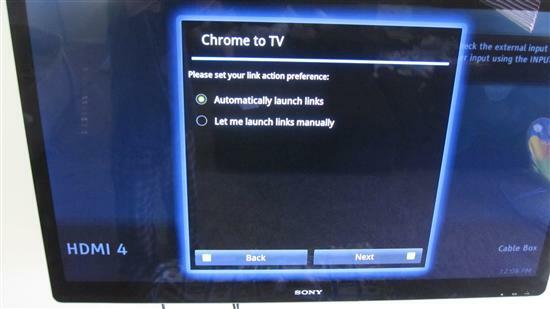 The next Chrome to TV setup screen asks you if you’d like to have links launch automatically after they’re sent to your Google TV or if you’d prefer to manually launch them. I prefer to auto-launch the links, but you can experiment with both options to see what you like best. That’s it, click the Finish button as shown below to complete your Chrome to TV setup! As the completion screen is so kind to inform you, you must now install the Chrome to Phone extension on your Windows laptop. If the link in the previous sentence doesn’t work, just go to the Chrome Web Store and search for “Chrome to Phone” to find the extension. After you install the Chrome to Phone browser extension, you’ll see a small icon in the top right corner of the Chrome browser that consists of a yellow arrow pointing to the right along with a little phone. Click that icon and it will prompt you to login with a Google account. Make sure to login with the same Google account that you used in the Chrome to TV setup. 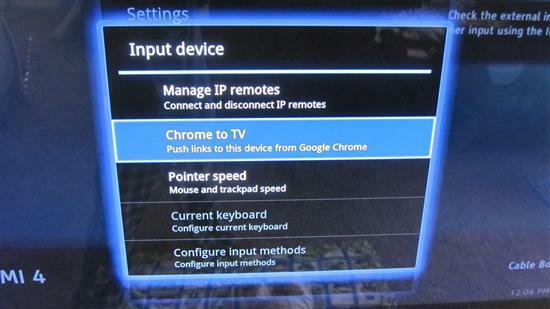 Once logged in, you can now begin sending web pages, links and URL’s to your Google TV from your Windows PC! Any time that you want to send a link to your Google TV, simply click the Chrome to Phone icon, as shown in the screenshot below. If you’ve configured Chrome to TV to automatically launch links, the web page will automatically show up on your Google TV with no further action required, as shown below. Enjoy using Chrome to TV! An astute reader would probably notice that the above instructions don’t require the Windows Operating System whatsoever. As long as you have the Chrome browser, you can easily send links to your Google TV, whether you’re using an Apple MacBook, a ChromeBook or any other OS that the Chrome browser is available on! The instructions listed in this article were created utilizing a Sony NSX46GT1 46″ HDTV Google TV device with firmware (Android) version 3.1 and build number 2011111402_AAV_ORSC.2011111411323. How about setting this up with a large screen ( In my case, a one year old 60″ Mitsubishi DLP.) that has a Sony Internet enabled Blue Ray player, attached? Is this something I have capability for, with such an ensemble? FWIW, this works for Chrome running in Linux as well. Just tried it out – pretty sweet. Ooops. I didn’t read the final paragraph of the article. Never mind! @Bob Phillips, yes this works with any Google TV device, including Sony Blu-ray players equipped with Google TV. I hope you’re reviewing your comments. I can’t disclose to the public yet but since you imply you own a Google TV I would like to ask you to load and test a specific type of URL for me. If what I am developing works as I presume and expect I will grant you free use of a software service I am developing. Great tip! I bought the Sony 46 inch GTV for my study and liked it so much I bought the GTV box for the living room. Love it but the box can be a bit, um, clunky. This is a great feature for sending websites right to the TV. Now if there was just a way to send them from my Android phone to the TV…? @Chris are you kidding? Install the “Google TV Remote” app for Android. 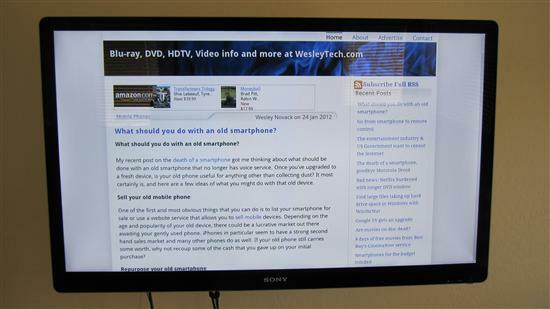 Once you have that you can “Share” web pages and all sorts of other stuff with your Google TV! Is there anyway to prevent loading the url on both phone and tv. I have the same Google account on my android phone and on my logitech revue and it’s very annoying to use my chrome to phone extension to push url to my cellphone and disturb who is watching tv at home. @Luiz, yes that is an annoying limitation that I’ve seen firsthand. My only suggestion would be to update your Chrome to TV settings to launch links manually instead of automatically. Then when you use the Chrome to Phone extension, the person watching TV can approve/cancel the launch of the link. Will it work from a Google Tablet or phone to Google TV? @Gerald Stegman Yes, simply install the “Google TV Remote” app for Android on your tablet or phone. When you want to share a web page, click the Share option and select Google TV Remote to send the website/URL/video to the Google TV. I thought it might work with Firefox, browser I use most, but seems not possible. I have Fox to Phone add-on, so I get them to my phone. Maybe using the Google TV app I can get them there to the TV somehow. Thanks for the post! Hi, I use this for both my Android and PC but from the PC today, it’s VERY slowwww. Any reason for that? No idea, I haven’t had any slowness issues with Chrome to TV from my PC. Unfortunately does not work with google apps accounts. Can’t believe these accounts are still treated like second class citizens with certain google features.